I have been busy taking care of everybody the past week. Donna was released from the hospital on Saturday, so I went and picked her up and took her home and got her settled. And then I had to feed Jens Kitties. LOL...not that I really needed to feed them because she has a ton of bowls of food & water around the house. They would be good for a few weeks with out me going over there! But I did feed them their fancy feast canned food and scooped the litter for her. So....after I got back from feeding them today, I decided it was time to do some creating! Here it is! It is Car Art. You can hang it from your rear view mirror. It is part of my new naughty girl collection. LOL Don't you love it! I have a collection. Well I will when i make the next one in the series! 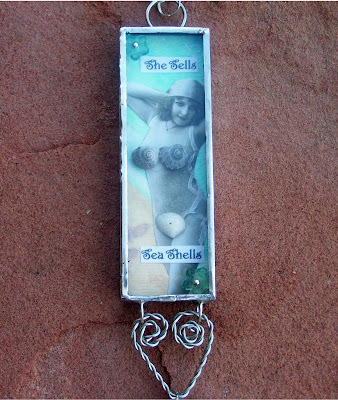 This one is called She Sells Sea Shells. I hand painted the background on watercolor paper with Twinkling H20's. 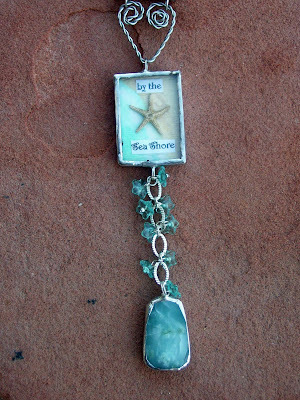 Created the collage, added shells and soldered the pieces. The bottom stone is a Peruvian opal. It is so pretty. Added a few little flowers beads and there you have it! Here is a close up of the top half: Yes those are real shells that are soldered between the glass. 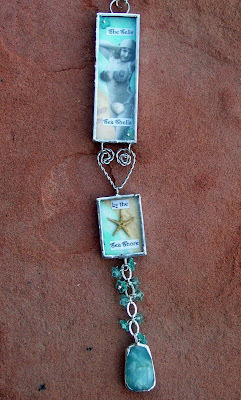 Here is a close up of the bottom half: That is a tiny starfish soldered between the glass. I am thinking of listing it on Etsy or Ebay. I haven't decided yet. So let me know what you think! So cute! Triple love it!!! LOVE the tiny starfish under glass! You are so creative and talented!!! I hope to do some soldering middle of this month with our art group, so I don't forget the things Sally Jean taught us. Seeing your pieces are inspiring me to do more soon! Gorgeous piece and the colours are dreamy.